At Telesis, we have more than 30 years experience in producing turnkey marking and traceability solutions to the world's largest and most respected manufacturing companies in the world. As the stringent needs of Medical Device Manufacturers continue to escalate, Telesis has proven our commitment to serving up solutions for medical device manufacturers by partnering with our client on their needs for medical market specific high quality, close tolerance workstations along with state-of-the-art laser systems. Through our investments in laser technology and innovative software packages, along with our process expertise and material handling know-how, we have developed a portfolio of capabilities that is second to none. 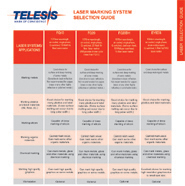 Our large installed base of laser marking systems demonstrates the Telesis focus on the medical device marketplace. 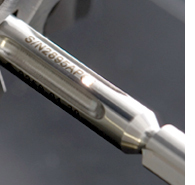 Exceptional laser marking solutions, standardized to simplify the medical device manufacturing process. E-series diode-pumped solid state lasers in near IR and Green wavelengths including the latest technology air-cooled EV40 vanadate laser system for medical device corrosion resistant marking on implants and surgical instruments. The proper laser solution coupled with the "best fit" workstation and material handling solution - Telesis offers "The Medical Manufacturing Standard" with our full in-house engineering staff to customize to your specific application when needed! Concerned with achieving corrosion resistance and surviving passivation with your laser marking of critical surgical implants? Having problems meeting the tight laser marked graduation tolerance specifications and repeatability on those medical instruments? Does your medical device laser marking application require the flexibility that only robotics can deliver or does a closed-loop XY with Theta answer as the best solution? Is it time you own a laser with a software solution that offers an operator interface with test mark power adjust, barcode scan for pattern load and variable text, and a log function to track the critical FDA data for marking, traceability, and validation?